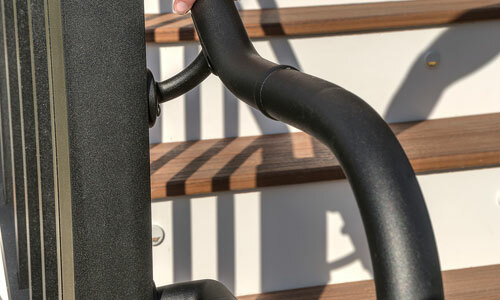 Trex ADA-Compliant Handrail | International Wood Products, LLC. Trex ADA Compliant Handrail offers strength, durability and peace of mind. The heavy duty aluminum system features a full complement of components to accommodate easy installation. The high-quality powder coated components resist fading, chipping and corrosion, and the wall mounts come with hardware for both wood and aluminum posts. Aluminum collars hide railing seams for a smooth transition between components, and aluminum cap ends conceal open rail ends. Trex aluminum ADA-compliant handrail is available in three colors to integrate easily with composite or aluminum deck railing.